Pre Heya Meghan and international workers of the world. Now I want a leather lunchbox, too. Haha, another playlist image with a clock on a wall in it! And that clock is about to be right — in the eastern time zone, anyway. I gather from their eye wear that they are welders? 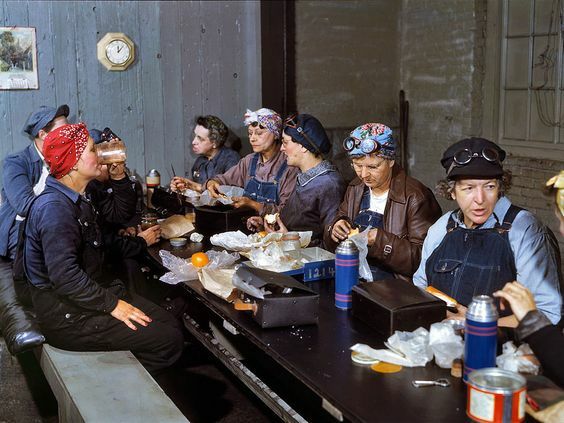 Caption: "Women employed as roundhouse wipers having lunch, Chicago & North Western Railroad, Clinton, Iowa. Marcella Hart is at left, Mrs. Elibia Siematter at right. 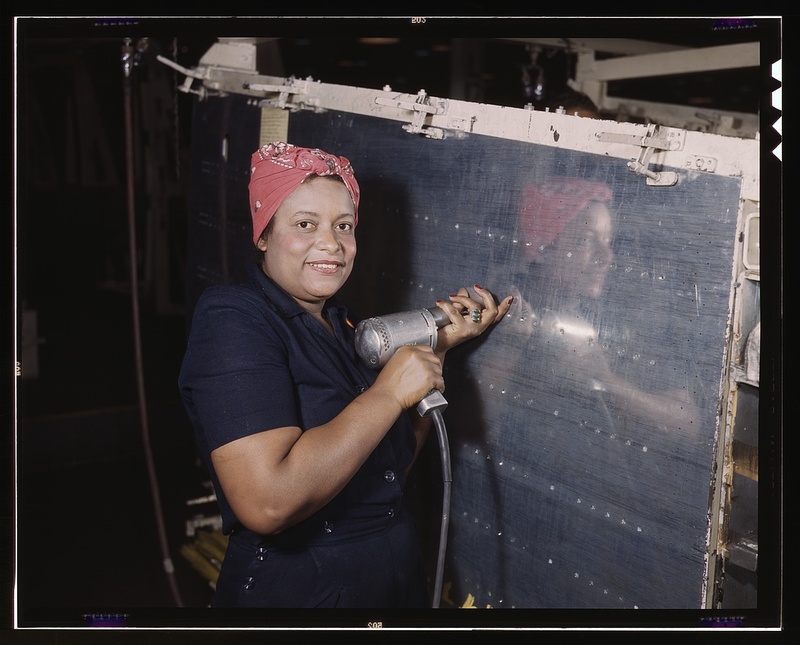 April 1943"
The real Rosie the Riveter? We're now sure it was Norma Parker Frawley and not Geraldine Hoff Doyle, even though we used to be sure it was Doyle. I think we'll probably never really know. Dave B, that Bored Panda page is just tremendous. Thanks. Good afternoon, Meghan and aquatic citizens. Aren't most of Sigur Ros's titles (and lyrics) actually gibberish. Hiya, Ms. Meghan, Underwater people, rogue Captain Nemo types, proto-amphibians, wanna-be land-dwellers. Did you see EFD's recent posting of his index cards that he uses to keep track of songs he's played? I don't believe I've ever had a physical calendar. (I have all of my cds in shelves and towers). The next time I see a wind-up gramaphone in an antique shop, I might buy it. I once created a digital interactive calendar of all the shows I was going to 10 years ago, so my friends knew where to find me. Still don't have a digital calendar. That's what's inside my brain-casing is for. i don't know what's inside my brain casing. whatever it is it's sticky and slippery all at once. those years that i don't get a calendar for free, a nice one, i don't get a calendar. Henceforth there will be a work requirement for that calendar. For several years now my calendar/planner....dollahhhh store! i used to get mailed a "murphy's law" calendar every year from a lawyer i used many years ago. that went directly to the free stuff pantry in town. i don't need a calendar that much. i suppose whoever lives at my old address still gets them. Maybe it goes to someone who relies exclusively on the Mayan or Jewish calendar....cuz Murphy’s Law. Now that clock is the right time for Madison. Meghan you know it's not! but that might be worth saving! Way-digging this Rambo Amadeus groove. I'm getting excited about Marathon, too! It's true, some early 90s music is closely related to the music of the 80s, because after all, calendars are arbitrary and time is an illusion! But the early 90s shoegaze scene, for instance, is distinct in some ways from the 80s. Lush, Curve, Swervedriver, and other such bands always sounded more "90s" to me than "80s", but it's all subjective. And you just played Think Tree recently! They put out a good album in 1991. These King Gizzard guys seem to put out a new album every other month! And in my experience, they're all good! Love this "Rattlesnake" track--it's totally badass. And there's kind of a Middle Eastern-y thing happening, to my ears. I never heard of them, but I'm an ignoramus. And anyway, I like them, so I'm cool, I guess. Uncle M@1:23. I was out of the room -- did Meghan mention the Marathon? Have they set dates yet? Oh just stay as long as you want. What are you making room for--the stream? ha, true..... but I do have to go to work! Oh, stupid work! I had to miss a show this week because of stupid work! Stupid work and stupid money and stupid paying bill. Stupid, stupid, stupid. Not to beat a dead horse here, $ is really stupid.